Conference attendees - Our listings are viewed by people in search of a conference, congress, seminar or course in a scienific or technical field. Conference organisers - Organisers visit our website while searching for websites on which to advertise their event. A significant part of our visitors is referred to our site from universities linking to our calendar. Such links are usually made directly to the pages that are relevant to the subject studied at that university. By placing a text ad or a banner ad on suitably selected pages, you will be able to reach a well targeted audience that visits those pages regularly in search of specific information. All adverts are inserted in the pages of the calendar, in the right column, next to the conference listings. Text ad - Text ads consist of a framed box (200 x 250 pixels) containing a heading, some text and a link to your homepage. Banner ad - Banner ads consist of a picture (200 x 250 pixels) that links to your homepage. All the events listed on our calendar are classified by topic and location. Visitors who select a page based on a topic, can then view lists of events corresponding to that topic in different locations. Visitors who select a page based on the location will be able to see listings in various categories for that location. Pages relating to a specific topic - Suitable for advertisement of an event. Pages relating to a specific location - Suitable for advertisement of venues, facilities, equipment, products and services. You can advertise meetings and tradeshows that do not fit our subject scope as well as goods and services other than meetings. The guiding criterion is that advertised items must be of potential interest to the typical target audience of the page that is to carry the advert. Products and services that are related to the organisation of conferences are good candidates for effective advertising. Equally, you might want to spotlight scientific equipment, services or training courses that relate to the subject of a particular page. 200 Euro (+VAT) on any one of the main subject index pages (Mathematics, Physics, etc.). 50 Euro (+VAT) on a page that lists conferences on a particular subject for all countries. 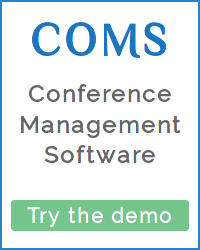 50 Euro (+VAT) on a page that lists all conferences in a particular country. 10 Euro (+VAT) on a page that lists conferences on a particular subject in only one country. These are one-time set-up fees and your advert would stay online until the end of the event. If you want to advertise items other than listed events, please enquire. Highlight your meeting, event or trade show in a box like this in order to reach a highly targeted audience. Placing the box at the top of relevant pages guarantees optimal visibility and you can link to your home page for further information. Events that are outside the subject scope of the directory as well as relevant services or products can be shown in a highly visible box like this. Target your customers precisely and effectively!